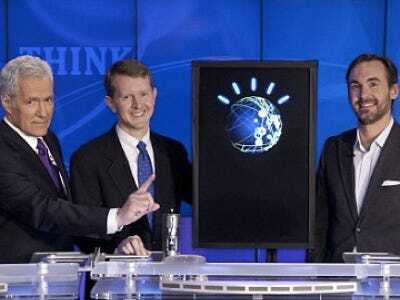 After drawing with human Brad Rutter in round one of Jeopardy, IBM’s Watson supercomputer spanked the competition in round two. Almost as if it were learning.Watson finished with $35,734 in winnings. Rutter had $10,000. Ken Jennings had $4,800. It would take a miracle for one of the humans to win in the final round tonight. However, Watson bungled the night’s final question, about what city has its largest airport named for a World War II hero and a second airport named for a World War II battle. It answered, “Toronto.” Jennings and Rutter, each a top “Jeopardy!” champ, both got the correct answer: Chicago.